Search.yourtelevisioncenter.com is the next questionable search engine that can pose a threat to your virtual security. This malware infection is indeed a browser hijacker that can modify your browsers’ home page, new tab page, and default search engine settings. This can take place even without your noticing it, which does not necessarily mean that this threat sneaks onto your system without your consent. 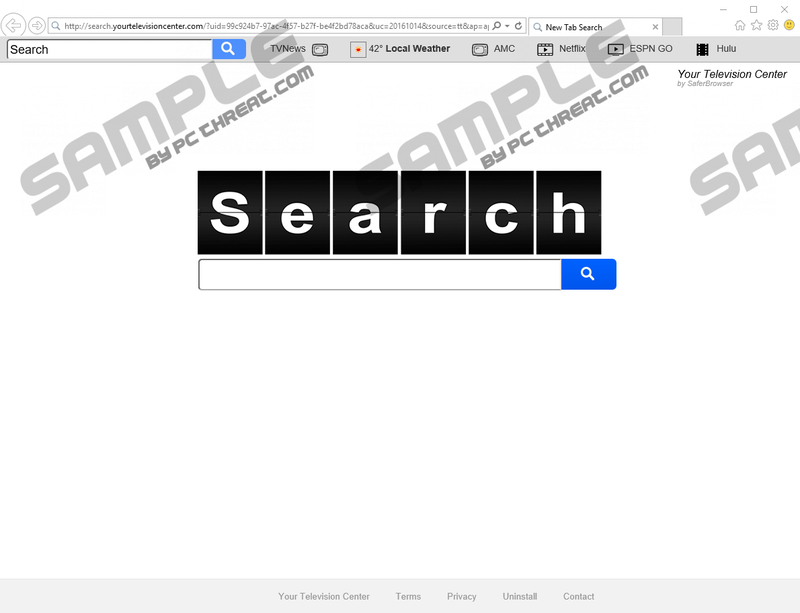 We have found that this browser hijacker is very similar to Search.yourmediatabsearch.com, which hit the web a few months back. 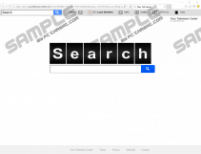 If you keep this search engine in your browsers, you may engage with it and cause additional security issues. The presence of this infection could also indicate that there are other malware programs on board, too. Therefore, there is no question for us that you should remove Search.yourtelevisioncenter.com and all other related and non-related malware infections as well if you want to be secure in your virtual world. You can find a promotional page on the web, yourtelevisioncenter.com, where you can directly install this tool. However, it is only possible if you first accept the terms by ticking a checkbox, which sets your new tab page to Search.yourtelevisioncenter.com. This is rather pushy even if you are informed about the browser setting change. From this official page you learn that this browser extension offers you an opportunity to watch your favorite TV shows and live sports, but what it does not tell you is that it simply provides you with quick links to reputable websites, including Netflix, Hulu, and ESPN, where you are supposed to subscribe or sign up to be able to see any worthy content. Therefore, this search engine page is totally useless because it only serves as a potentially unreliable mediator, which you do not need at all. Unfortunately, this browser hijacker can also be found spreading in freeware bundles that could be packed with other malicious software installers, including adware programs, other browser hijackers, keyloggers, and Trojans. Infecting your system with such a lot could create chaos in no time. It is important that you keep away from questionable file-sharing websites and you stick to official and reputable pages to download free software. As you can see, even official sites can be fake or malicious; this is why we always try to emphasize the importance of doing proper web research before downloading anything from anywhere. Another great tip to avoid downloading bundles is to avoid third-party ads and websites that are filled with them. All in all, you should delete Search.yourtelevisioncenter.com right now and scan your system with a reliable online malware scanner to see clearly about your malware situation on board. We do not recommend that you click on any buttons on the fake toolbar this extension offers you because you could be introduced to potentially unsafe third-party ads coming from cyber criminals. For example, when you click on the TVNews button, you get redirected to search.yourtelevisioncenter.com/Widgets/TV?uc=17000101&userid=c50a8a31-b92e-4f0f-a3de-9d54b024d8df&implementation=undefined, which is indeed a widget as you can see from this address, and the page is filled with third-party ads. Clicking on any of those on this page could lead to more malware threats or redirections to malicious websites. But you cannot trust the search engine itself either. This hijacker may collect information about you and record your queries, too, to be able to show you customized advertisements and links on the results pages. However, you would most likely trust these pages as you land on Yahoo. Keep in mind that even though you are on a reputable search results page, it could contain possibly unreliable ads and links that come through this browser hijacker. Cyber criminals may take advantage of this tool and embed their own vicious links. Clicking on these could lead you to malicious websites and more system security issues may emerge. If you do not wish to tackle more malware invasions, you should not think twice before you delete Search.yourtelevisioncenter.com. Depending on where you downloaded your version from, there is a possibility that you will find an uninstaller in your installed programs list in Control Panel. However, we have found that this uninstaller may only remove the extension from Internet Explorer. Therefore, you also need to remove the extensions from the remaining browsers, Mozilla Firefox and Google Chrome. Please use our instructions below if you need help with the necessary steps. If you want decent protection for your computer, we suggest that you download and install a professional anti-malware application; the sooner, the better. But even if you are lucky enough to have a proper security tool safeguarding your system, it is still important that you keep all your drivers (Java and Flash) and your programs regularly updated. This can save you unnecessary headaches because cyber criminals may exploit outdated versions and their bugs to gain access to your files or drop infections onto your computer. On the left, select Extensions. Click on the undesirable extension and click on the trash can icon. Quick & tested solution for Search.yourtelevisioncenter.com removal.